NEW ORLEANS – Don’t look now, but we’re already five days into the last full month of the indoor track & field season. Athletes around the nation are definitely rounding into form and the marks they’re turning in are proving just that. 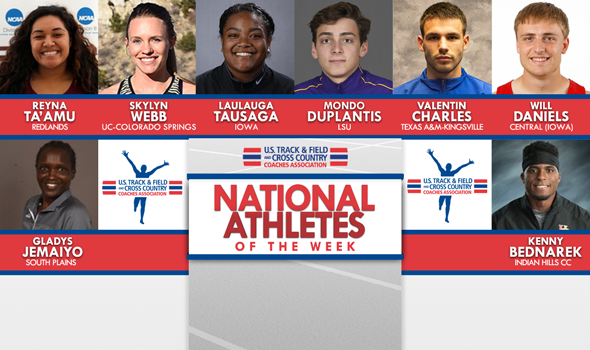 Here are eight of those athletes who posted huge marks and were named National Athletes of the Week by the U.S. Track & Field and Cross Country Coaches Association (USTFCCCA) on Tuesday. National Athlete of the Week is an award selected and presented by the USTFCCCA Communications Staff at the beginning of each week to eight collegiate indoor track & field athletes (male and female for each of the three NCAA divisions and the one NJCAA division that sponsors indoor track & field). Mondo Duplantis is now one of two men in collegiate history who have cleared 5.87m (19-3) during the indoor season. The other is record holder Shawn Barber, who Duplantis is now within shouting distance of. Duplantis soared over that bar this past weekend at the LSU Invitational, putting him five centimeters (two inches) away from breaking Barber’s four-year-old collegiate record. He took three attempts at 5.92m (19-5), which would have given him the record if he went over, but he fouled on all three attempts. The freshman phenom entered the collegiate scene with a lot of hype surrounding him and justifiably so. He now has two of the top-7 vaults in collegiate indoor history. Duplantis is the first male athlete from LSU to be named National Athlete of the Week during the indoor season. Back in 2015, Tori Bliss became the first LSU athlete, period, to earn the honor on January 13. It took two throws this past weekend for Lauauga Tausaga to put her name in the collegiate indoor record book in the weight throw. The junior from Spring Valley, California, let one fly at the Frank Sevigne Husker Invitational that sailed 23.26m (76-3¾). That mark tied Tausaga as the 10th best performer in collegiate indoor history. She also notched three other marks that were in the top-10 of the week. 🎆 SHE DOES IT AGAIN!!!!!! If the NCAA Championships started tomorrow, she would also qualify in the shot put. She currently sits 15th on the Descending Order List in that event. Tausaga is the first Iowa athlete to be named National Athlete of the Week during the indoor season. She is also just the second female athlete from the Big Ten to be honored (Penn State’s Danae Rivers was the first three weeks ago). Valentine Charles is a National Athlete of the Week after having one of the best performances in NCAA DII history this past weekend. The Rennes, France, native recorded the sixth-best heptathlon performance in NCAA DII history with 5544 points at the MSSU Lion Open & Multi. The mark set a new school and conference record and ranks as tops in the country by 340 points. Charles is the third athlete in school history to earn the national award during the indoor season, joining Jeron Robinson in 2016 and Lutalo Boyce in 2015. Skylyn Webb picked up the National Athlete of the Week honor after etching her name into the record books. The senior ran an NCAA DII all-conditions best of 2:04.68 in the 800 at the Colorado Invitational. The mark set a new school record and placed her as the top collegiate athlete at the meet in a field that included top athletes from NCAA DI, NCAA DII and the professional ranks. The time converts to 2:03.87 for NCAA seeding purposes, which is the top time in the nation by almost a second and a half. Webb is the only athlete in program history to earn the National Athlete of the Week honor during the indoor season. She also achieved the feat during the 2018 season. Remember when Will Daniels notched the fourth best score in NCAA Division III history in the heptathlon earlier this season? Well, he topped himself. This past weekend at the Wartburg Indoor Select, Daniels broke the NCAA DIII record in the event with a score of 5441 points. That bettered the old record of 5434 by Richard Roethel that had stood since 2012. Daniels started things off with a time of 7.01 in the 60 and followed that up with a mark of 6.72m (22-0¾) in the long jump. He chucked the shot 12.98m (42-7) and cleared 2.06m (6-9) in the high jump. Then he went 8.59 in the 60 hurdles, 4.40m (14-5¼) in the pole vault and wrapped things up with a time of 2:54.54 in the 1000. This is the second time this season that Daniels has been named National Athlete of the Week. He also earned the honor back on December 4. Reyna Ta’amu put her name in the NCAA Division III record book this past weekend. Ta’amu launched the shot 15.52m (50-11) at the Mountain T’s Invitational and placed second among all competitors. Not only was that a PR by a substantial margin, it also left her as the seventh best performer with the ninth best mark in NCAA DIII history. This is the first time that an athlete from Redlands has been named National Athlete of the Week during the indoor season. Kenny Bednarek is a National Athlete of the Week honoree after continuing his record-setting pace in his freshman campaign. The Wisconsin native went 20.30 at the Frank Sevigne Husker Invitational to set the NJCAA record, besting a mark that he set in early January. The performance won the race against a field that included NCAA Division I athletes. 20.30 World Lead & NCAA top ten all time! Kenny Bednarek cannot be stopped!! It is the third time this season that Bednarek has earned the award. He currently sits No. 1 in the NJCAA in both the 200 and 400. It is the fifth time an Indian Hills CC athlete has been selected for the award. Gladys Jemaiyo picked up a National Athlete of the Week selection after setting a new NJCAA record this past weekend. Jemaiyo ran an NJCAA-leading 16:51.52 in the 5000 at the Charlie Thomas Invitational and broke the old record by more than four seconds. The performance placed her third against a field that included NCAA Division I athletes. She becomes the third female and ninth athlete overall to win the award from the program during the indoor season. It is the first earned by a South Plains athlete since 2017.